Aero has always been difficult to fit a saddle to. When he was jumping, we used a gel-flocked Pessoa on him, and it seemed to suit him well, we had few issues with his back in those days, but then again, the Youngest Daughter was riding in the half-seat a lot of the time. Then dressage took over, and the trouble began. 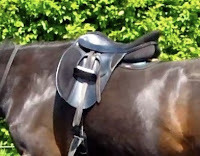 I had a lovely Albion dressage saddle, which had been a present for my fortieth birthday. 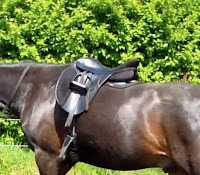 We used it on Aero when he started eventing, but it became clear that it didn't fit (it was too wide), so we had our local saddle-fitter out, and bought the basic Wintec dressage saddle that was available at the time - I can't remember the model name. That seemed to work ok for a while, and then he started getting bald patches at the back of the saddle, and the YD started to complain of back-pain. 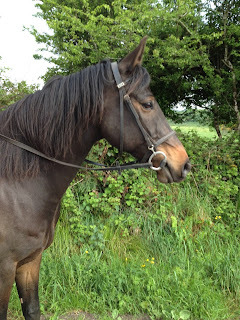 The saddle-fitter visited again, and we came to the conclusion that he had changed shape substantially and had muscled up particularly around his shoulders, tipping the saddle backwards. She suggested using a riser pad, but I'm afraid I have an aversion to riser pads, and I got a bit stubborn about it! My feeling was that a saddle bought for a specific horse should fit without having to be raised here, or lowered there, so we compromised and sent the saddle away to be reflocked, emphasising that it needed to come up at the back. It made no difference whatsoever, so we scratched our heads and thought a bit. The YD was getting serious about dressage, and they were doing really well (reserve National Champions at Novice level!) so we decided to invest in their career, and buy a more expensive fitted saddle. Measurements were taken, templates were made and the whole lot were sent off to the manufacturer. Along came the Bates Isabell Werth saddle with Cair panels and adjustable gullet - the most expensive saddle I've ever bought. This was the one, this would stop the YD's back pain, put her in a better position and enable her to sit deeper in the saddle, allow Aero's baldy patches to disappear completely, eliminate all of his tension issues and turn him into a more extravagent mover. Yeah, right. Rider's back pain continued, horse went exactly the same, we ended up continuing to use the big fluffy sheepskin pad under the saddle to protect his back. 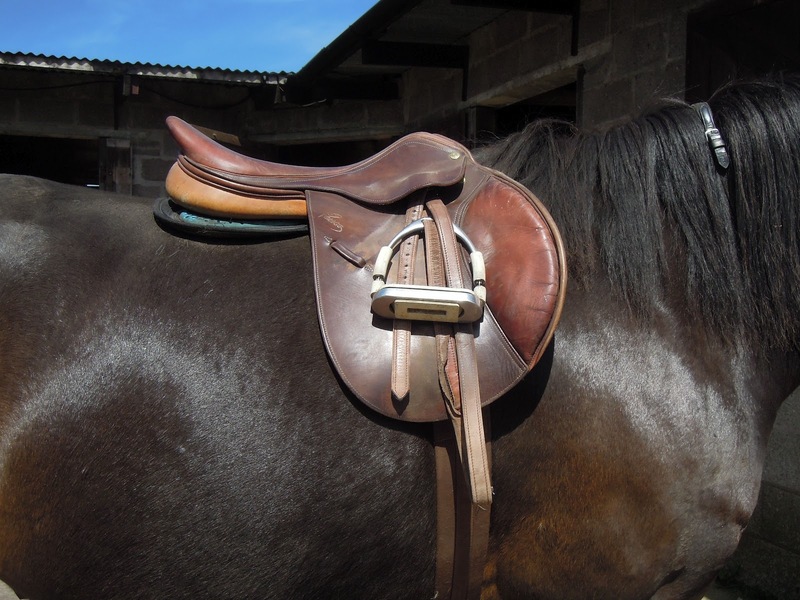 The saddle must be right, we said, it was fitted especially for the horse. So many riders complain of back pain that we concluded that back pain and dressage go hand in hand, and of course we had to have the horse physio out every couple of weeks, doesn't everyone? Fast forward to the present. I've been mixing Aero's work up all week - lunging with no tack and going for a little walk in hand afterwards, or lunging with tack and riding for a short while afterwards, either in the arena or on the road. 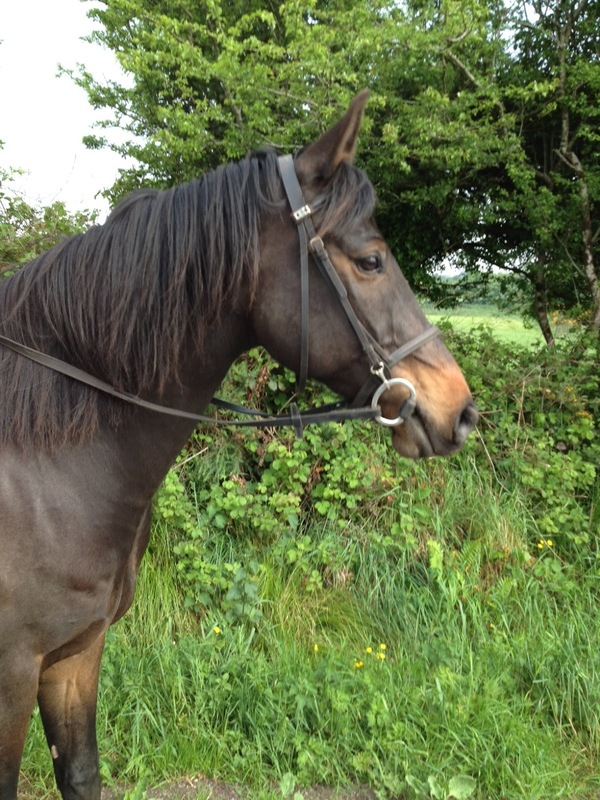 Trying to vary it and keep him interested, basically - bear in mind that this horse was depressed and arena sour when he came back to us last autumn. I've always found him a little uncomfortable to ride, (I affectionately call him The Camel Horse) but I'd been hoping that after Le Big Trek, I'd be fit enough to cope with his swinging walk and big bouncy trot. Nope, apparently not. I felt like a complete beginner, falling behind the movement in trot and falling in front of the movement on downward transitions. I tried using my own Wintec dressage saddle, which, after 500km, is perfectly moulded to the shape of my bum and which feels like "home" on Flurry, but it made no difference, I still felt out of balance and awkward and Aero felt unhappy and reluctant to move forward - not surprising really, with me impersonating a sack of spuds on his back! I had ridden in the Bates saddle a couple of times shortly after we bought it, but I found it horrifically uncomfortable - it stretched my legs and hip joints in ways they were not accustomed to, so I'm really reluctant to use it. In desperation, I tried using Aero's old jumping saddle. He stretched nicely in walk and seemed a little happier, but I felt hopelessly unbalanced and insecure. The leather felt as slippery as polished steel under my bum compared to the nice grippy synthetic fabric of my Wintec, the flat, close-contact seat didn't hold me the same way at all and I still felt like I was being thrown behind the movement every stride. At rest, the Pessoa seems to sit fairly level on him but while lunging him one day, something caught my eye. 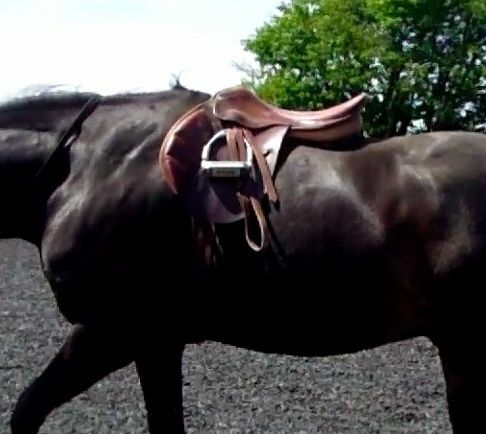 Was it just my imagination or did the saddle tilt backwards with every stride? I videoed what I was seeing and then looked at YouTube videos of horses being lunged, and I was fairly convinced that what I was seeing on Aero was unusual, so I pulled some stills out of the video for comparison. I did the same thing with Flurry's saddle and thought it seemed more pronounced with this. 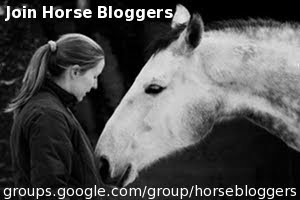 It may seem like a miniscule difference to some folk, but if the rider is being thrown back onto the horses loins every stride, a) the horse will develop a sore back and b) the rider's back will also be sore from constantly trying to fight gravity. 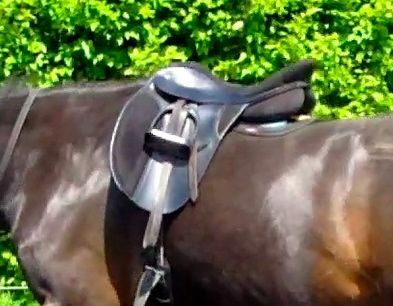 The gel pad I was using raises the cantle a small amount, but what if I could raise it a little more, so that the saddle stops tipping backwards at all? What if I used a (gulp) riser pad? 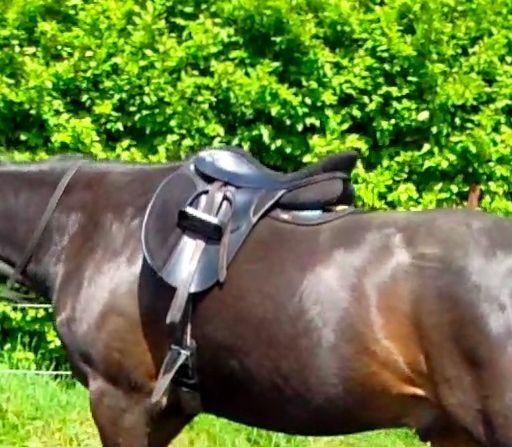 What if I've been wrong all these years and Aero's conformation is such that he needs a riser pad no matter what saddle he's wearing? Cue quick trip to the saddlers, returning home with shiny new riser pad. I'm woman enough to ehhhhh.....NEVER admit when I'm wrong, but I might make an exception in this case! The riser pad made a difference immediately, I thought the Wintec looked better while I lunged him. I was pleased enough with the change that I hopped up on him straight away and I was delighted to find I was better balanced, while he seemed happier and stayed rounder. I'm toying with the idea of using my gel pad as well... I'll just keep playing around for a while til I find the best arrangement. I'm even beginning to feel like I might actually manage to ride him properly some day! I hacked him out this morning with his Renegade boots for the first time. The boots don't twist at all on him, unlike on Flurry and Gigi. The validates our theory that the boots were twisting because both Flurry and Gigi are not straight movers, unlike Aero. Best of all, he felt alert, interested and happy the whole time.